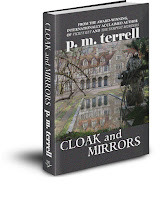 I’m happy to have suspense novelist P.M. Terrell back on Reviews and Interviews. She was last here in 2012. Today we’re chatting about Cloak and Mirrors. During her virtual book tour, P.M. will be awarding a Celtic necklace containing the Tree of Life (USA only) to a lucky randomly drawn winner. To be entered for a chance to win, use the form below. To increase your chances of winning, feel free to visit her other tour stops and enter there, too. P.M. terrell is the pen name for Patricia McClelland Terrell, the award-winning, internationally acclaimed author of more than 20 books in several genres, including suspense, historical and non-fiction. Prior to becoming a writer, she owned two computer companies in the Washington, DC with a specialty in combatting computer crime. Her clients included the CIA, Secret Service and Department of Defense. Technology is often woven through her suspense thrillers. Terrell is of Irish descent, and Ireland often figures prominently in her books as well. She has been a full-time author since 2002 and currently travels between her home in North Carolina and Northern Ireland, the home of her ancestors. She is also the founder of Book ‘Em North Carolina’s Writers Conference and Book Fair and The Novel Business. Welcome back, P.M. Please tell us about your newest release. 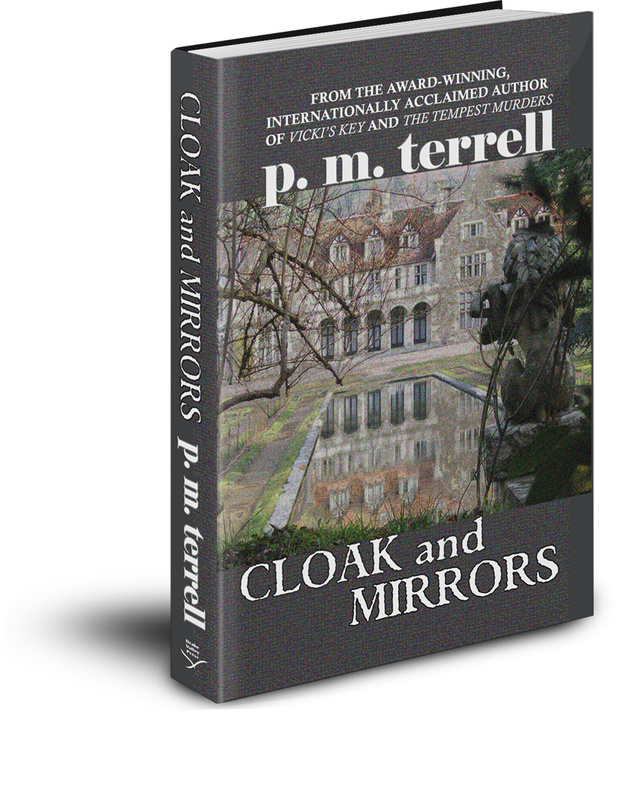 Cloak and Mirrors is the 6th book in the award-winning Black Swamp Mysteries Series. I loved writing this book because it takes place in Ireland, where the main character, Dylan Maguire, was born and raised. Dylan and Vickie are married in the tiny village where Dylan grew up and then they travel to Donegal and the Wild Atlantic Way for their honeymoon. They are both CIA operatives and they discover that the CIA can even interrupt a honeymoon. They’re asked to retrieve a microchip containing stolen Russian plans for their new stealth technology which should have been a simple task. But when the Russian point of contact decides to defect, they find themselves dodging Russian operatives in an attempt to rendezvous with an American hand-off. The book allowed me to use Ireland almost as a character itself, with its breathtaking and often dangerous landscapes, rope bridges, cliffs, the Blue Stack Mountains and Donegal’s quaint and beautiful streets. It was a natural progression for Vicki and Dylan to get married and I knew the most romantic, mystical and beautiful location would be Ireland. During one of my recent trips to my ancestral home in Ballygawley, County Tyrone, Northern Ireland, I had an occasion to speak to several people about The Troubles, a thirty-year period of violence that divided Northern Ireland into two factions: those who wished to remain part of the United Kingdom and those who wished to be reunited with the Republic of Ireland. I found the experiences to be so intriguing that I wrote in a character that helps Dylan navigate the wild and rural Irish landscape—a man whose past included work with the Irish Republican Army. Stealth technology is something several governments have been working on for quite some time. Once the technology is discovered and used, the opposing military seeks to infiltrate it so that more “invisible” means of cloaking and mirroring are needed on a regular cyclical basis. I find the rapid advances in this type of technology to be fascinating. I am actually switching to an historical series because so many readers today are looking for escape from politics and the dangers of the day. In researching my ancestral home, I discovered a treasure trove of information about my ancestors: why they left Scotland for Ireland, their changing allegiances for or against England (much depended on the King or Queen at the time) as well as their personal hopes and dreams for their children’s futures, which led some to immigrate to the United States. I have begun in the year 1608 with my ancestor’s decision at the age of 18 to emigrate from Scotland to Ireland. It is a tumultuous period of colonization with warring clans, romance, crosses and double-crosses, devastating natural and man-made disasters. It has been very exciting to research—necessitating more trips to Ireland! For me, it is the beginning and the ending—not of the story itself but the writing of it. I mull various ways of opening the book and laying the groundwork in a way that will capture the reader’s interest immediately so that action begins right away. From there, the book unfolds smoothly as I reach a mid-point that is almost like a climactic scene in itself and propels the rest of the book forward at breathtaking speed. When I am finished, I always have a sense of loss as if all the characters had been guests in my home and they have all moved out at once, leaving an emptiness behind. I perform quite a bit of research in the beginning so I know the plot I am considering will carry the book and make for exciting reading. Then I continue to perform research throughout the book. I love using the Internet; I can easily hop onto websites that I know have reliable facts. Then during the editing process, my editor may ask a question that leads me to perform more research in order to flesh out certain scenes. I once served on a panel with an author that claimed he never did one minute of research for an FBI series he writes and that shocked me. My office is on the second floor of a detached garage. I have a 360 degree view, which I love. I have Celtic memorabilia surrounding me, such as a Celtic suncatcher, photographs of my ancestral home in Northern Ireland and the Irish coastline. I write on my laptop with my three dogs—two Jack Russells and a collie—at my feet. It isn’t necessary for readers to have read the earlier books in the series in order to understand and enjoy Cloak and Mirrors, because I have enough backstory to fill in all the gaps. But if readers would like to read them in order, they are: (1) Exit 22, (2) Vicki’s Key, (3) Secrets of a Dangerous Woman, (4) Dylan’s Song, (5) The Pendulum Files and (6) Cloak and Mirrors. Thank you for coming back to Reviews and Interviews! Happy writing! What a wonderful excerpt! Eerie, indeed. Thank you for sharing it. Thank you for hosting me here today, Lisa. It's great to be back! And Fran, thank you so much for your comment. I am a big fan of your writing. I'll be checking back later and I'll be happy to answer any questions anyone might have. I'd love to know how many believe in ghosts or have ever seen any? oh this book sounds good! I love finding new authors to read. Thank you for dropping by and leaving a comment, DanieX. I hope you enjoy the book! Thank you for leaving a comment, Christie! I'm glad you enjoyed the interview. I'm a big fan of your books!